A new boron-diffusion treatment process applied to cold-forming dies at Marine Exhaust Systems Inc., Riviera Beach, FL, has allowed the firm to form stainless-steel tube and pipe sections with about one-third less pressure than before. And, the improved die-surface lubricity means less friction, which reduces wear and tear on the press. So says Richard Hall, metal fabrication coordinator at Marine Exhaust, describing the proprietary die-treatment process (Generation II, from B4C Technologies, Palm City, FL) applied to its tooling since 2012. The treatment process creates hardness without causing brittleness, while increasing impact resistance and ductility. 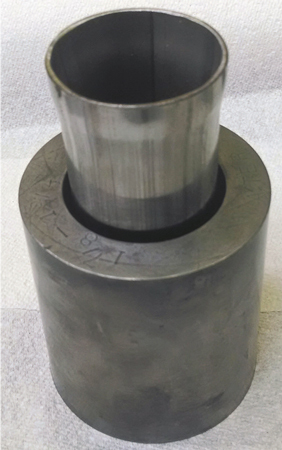 “Less pressure means less risk of damage to our personnel, the machine and the die,” says Hall, noting that the Generation II process adds permanent lubricity and high hardness to the treated sections, and helps forestall galling, by converting the treated surface to an intermetallic ceramic. Cold-forming dies at Marine Exhaust shape Type 316 stainless-steel exhaust tubing. One die in particular, explains Hall, is used to expand a pipe from 4-in. dia. to 6-in. dia. over about 4 in. of pipe length. The expanded area is visible when installed in the vessel, so appearance is important as well as function. Prior to using the B4C die treatment, after an average of eight to 10 cold-form pressings, and sometimes after only two or three, the formed area of the pipe would begin to show scarring or other imperfections that made them unusable. This meant that the die would have to be taken off of the press and sent to the machine shop to be resurfaced—a 90-min. process. And, after a die had been refinished two or three times, it had to be discarded. Now, having had the tools treated with the B4C process, Marine Exhaust has pressed 591 parts on the die over a 2-yr. period, and continues to press out parts without the die having to be resurfaced. “That die was my problem child; it takes a lot of abuse,” Hall says. “The formed pipe is clearly seen by the customer and at one end has a flexible hose covering it. If the formed pipe has scars (galling) on it, it is susceptible to leaks because the scars would prevent a perfect seal of the hose or could choke the hose. What substrate are you using? Is it tungsten carbide or another type of tool steel?